If you were to ask an operator or even some leaders what standard work meant to them, you might get responses such as “standard operating procedures,” “work instructions” or “check sheets.” These are all legitimately correct answers. 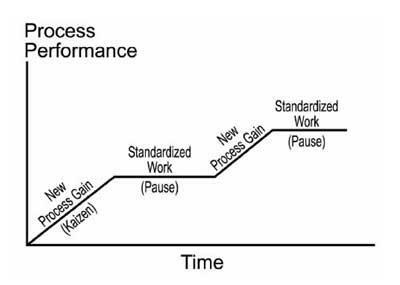 What you might not get is that standard work is the basis for driving all continuous improvement actions. This statement is often ignored as companies work to improve their performance. The initial attempt to quickly resolve issues so that the team can see action being taken may result in the essential element of continuous improvement – root cause analysis—being overlooked. 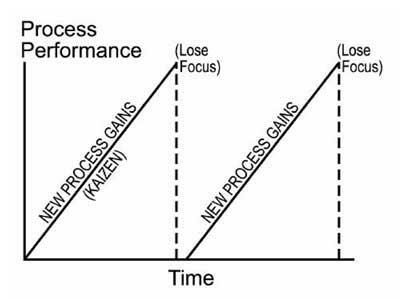 An important part of truly understanding the relationship of variables on a process comes from stabilizing the effects of changes made to improve it. Traditionally, one may view the lack of this understanding in Figure 1 below. The intent here is to quickly take care of issues by putting into action what we believe to be the fixes necessary to the process. This type of “fire-fighting” usually results in busy activities that may not be truly focused on the larger root causes apparent in the process. Applying standard work to the process and understanding the effect of the changes will allow better learning for the operators and leaders. The effect of this method is presented in Figure 2 below. The critical component in this effort is using tools such as a fishbone diagram or creating a Pareto chart to detail and quantify the issues. The diligence and discipline of executing this is necessary for acceptance and use in your discovery of root cause analysis. At times the activity may be painful to start, but the benefits in learning by all will certainly outweigh the costs and will be welcomed and expected by everyone.